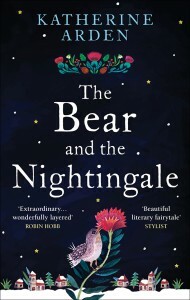 I get the feeling that The Bear and the Nightingale is one of those books which will either really work for you as a story or it will be just okay, depending on how familiar you are with Russian folklore and/or history. In classic fairytale style, the story starts with a small girl and her new step-mother, but Vasya is not just any girl and neither is her step-mother - both of them can see the supernatural creatures surrounding them (the domovoi who lives in the oven, for example) but while Vasya builds relationships with them, her step-mother Anna believes they are demons. Vasya's father is the boyar, a local landowner living far from Moscow, who subsequently is sent a priest and icon-maker who is just a little too popular in the capital. The arrival of Konstantin, just as Vasya is getting to marriageable age and her father hopes she will settle down a little, leads to all sorts of problems with the balance between mundane and supernatural. Vasya herself is eminently likeable, strong-willed despite opposition and willing to do whatever is necessary to keep the people who are important to her safe, even in the face of supernatural forces. The series continues in The Girl in the Tower, which is due out next month - I'll definitely be picking that one up at some point in the near future, as Vasya is such a great main character.